'A tragic tale about falling in love on the world’s most infamous ill-fated sea voyage as heroine, Tess, discovers darker secrets that lie beneath the doomed crossing… and a hidden brotherhood that threaten to tear her lover from her forever. I'm the Mum of District YA, otherwise known as Sue, and was very kindly given Fateful to read by my daughter Leanne. The first I saw of this was when she was received the book from the very kind Harper Collins, I immediately grabbed it to be the first to read it. I've always been very interested in the Titanic story, so much so that I went to the O2 last year to see the Titanic exhibition, which was amazing, so when I saw the brilliant cover on the Fateful novel, it really grabbed me to read it. The cover shows a young blonde woman standing on the deck of a ship, wearing a red silk gown, with a full moon behind her, and just below the moon is an ominous looking Iceberg, which really says it all!!!! Fateful in my opinion is Downton Abbey meets Supernatural, its an easy read with highs and lows. Claudia Gray writes her book with scenes that are easily understood, you walk the streets, cabins with a real understanding of the area your in. In my youth I actually travelled to Australia and back to England on a ship, so could really relate to the characters feelings of being in an isolated, small area for a very long stretch of time. A lot of the feelings I had at the time resurfaced & got me thinking of things that happened, not all of them carefree and happy, but that is a whole other story. The book starts on April 12th 1912, and revolves around Tess a teenage maid to the impressive Lisle family. Tess has decided to start a new life, hopefully a better life in America with the Lisles, a rather complex family. You see how her hard life working for the Lisles is, and I felt Claudia Gray transported me to that time. Tess works so hard, I really embraced her character and when she meets Mikhail, who wants harm to come to her, its a case of reading the pages quicker to make sure shes okay. Then there is the beautiful Alec, who you want to be the opposite of Mikhail, poor Tess all alone, you want her to be helped. We all know the story of the Titanic, and obviously the outcome, but this adds to Fateful, because you know there's only 5 days for this situation to end one way or the other, and and as the days are counting down in the book I found myself willing Tess along. All along reading the book I kept thinking of Upstairs, Downstairs and also of the 1950's film of Titanic, and was so pleased when I read the Authors notes at the end of the book, found she'd had both of these in mind, whilst writing Fateful. The book has Love, Intrigue, Mystery, Supernatural element and in my opinion was a really good read. I completely agree with you on the cover! And I've always been fascinated by the story of the Titanic. I think I might have to give this one a go. 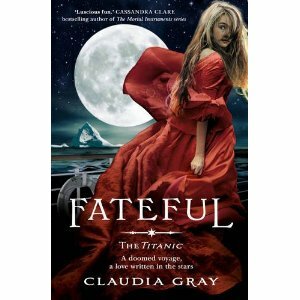 The cover is beautiful, that, and the fact I've always loved anything about the Titanic are making me want to read this! Is the 1950s film A Night to Remember? If it is then that just makes me want to read it even more, that's always been my favourite Titanic dramatisation.